Amanda has extensive experience in law-based multidisciplinary research, particularly incorporating the social sciences. 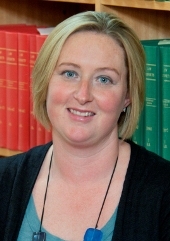 Her research has been shaped by her interest in contract law and dispute resolution, with emphasis on the influence of legal instruments and institutions upon stakeholder behaviour. Her PhD research examined the law governing industrial agreements against the background of social context, and she has developed aspects of her approach in her more recent work on natural resource governance. Since commencing the role of Deputy Director of the Australian Centre for Agriculture and Law in 2008, Amanda has focused upon instruments and institutions for effective natural resource governance. Notable contributions to this field include research examining conflict over ownership of natural resources on publicly-owned land and the concept of ‘social licence’, research into the risks and benefits associated with ‘unbundling’ rights (to carbon, water and other evolving interests) in land, and research into the use of non-legal instruments (such as social marketing tools) to manage natural resource use. Amanda was the lead organiser of the 2011 University of New England Colloquium on ‘Water Law: Through the Lens of Conflict’. This event attracted high profile international academics in the field of natural resources and water law, and critically examined the role of legal institutions to provide new insights into water law. During 2012, Amanda will lead two major research projects. The first of these is a $375,000 Australian Research Council Discovery Early Career Researcher Award (DECRA), which will see her lead a three year project entitled ‘Effective systems for managing intractable natural resource conflict’. This research will examine how patterns of conflict over natural resources develop, and how disputes may be effectively managed through approaches that account for divergent stakeholder values and the influence of legal and non-legal rule frameworks on conflict. It will propose a system for managing such conflict, drawing upon literature research and comparative case study observations from Australia and the United States. The second is a $133,000 Department of Education, Employment and Workplace Relations grant entitled ‘Rethinking law curriculum: developing strategies to prepare law graduates for practice in rural and regional Australia’. This project seeks to develop strategies within the undergraduate law curriculum to prepare, attract and retain lawyers and other legal professionals for legal careers in rural and regional Australia. Amanda is the Academic Master of Earle Page College. She is also the Alumni Member of the International Leadership Council of the Golden Key International Honour Society. Link to UNE’s e-Publications for Amanda Kennedy’s complete publications list. Link to UNE’s e-Publications for A.L. Williamson’s complete publications list. Kennedy, A.L., and Phromlah, W., ‘Behavioural strategies to support climate change resilience’ in Critical Issues in Environmental Taxation, Kreiser et al. (Eds. ), Edward Elgar Publishing (2011). Martin, P., Williams, J., and Kennedy, A.L., ‘Creating next generation rural landscape governance’ in Environmental Governance and Sustainability, Carruth et al. (Eds.) Edward Elgar Publishing (2011). Becker, J. and Kennedy, A.L., ‘American Agriculture’s Social License to Operate’ in Defending the Social Licence of Farming, Williams, J.A. and Martin, P.V (Eds. ), CSIRO Publishing (2011). Kennedy, A.L. and Winn, S., ‘An examination of continuing professional education (CPE) opportunities for legal practitioners in rural and regional Australia’ (2011) 16(1) Deakin Law Review 209. Martin, P.V., Williams, J.A., and Kennedy, A.L., ‘Professional networks and rural services poverty’(2011) 16(1) Deakin Law Review 57. Kennedy, A.L., and Martin, P.V., ‘Country Report: Australia’ (2011) 2 IUCN e-Journal. Kennedy, A.L., ‘Using Community-Based Social Marketing Techniques to Enhance Environmental Regulation’ (2010) 2 Sustainability 1138. Brower, A., Page, J., Kennedy, A.L., and Martin, P., ‘The Cowboy, the Southern Man, and the Man from Snowy River: The Symbolic Politics of Property in Australia, the US, and New Zealand’ (2009) 3 Georgetown International Environmental Law Journal 455. Kennedy, A.L. and Winn, S., ‘An examination of continuing professional education (CPE) opportunities for legal practitioners in rural and regional Australia’, paper presented at the National Rural / Regional Law and Justice Conference, 19-21 November 2010, Warrnambool, Victoria, Australia. Martin, P.V., Williams, J.A., and Kennedy, A.L., ‘Professional networks and rural services poverty’, paper presented at the National Rural / Regional Law and Justice Conference, 19-21 November 2010, Warrnambool, Victoria, Australia. Kennedy, A.L., and Phromlah, W., ‘Using behavioural tools to support economic instruments for climate change resilience’, paper presented at the 11th Global Conference on Environmental Taxation Issues (GCET), 3-5 November 2010, Bangkok, Thailand. Becker, J.C., Luloff, A.E., Finley, J.C., Martin, P.V., and Kennedy, A.L., ‘Towards a contemporary behavioural science basis for effective regulation’, paper presented at the Eighth Annual Colloquium of the IUCN Academy of Environmental Law, 13 – 17 September 2010, Ghent, Belgium. Martin, P., Williams, J., and Kennedy, A.L., “Creating next generation rural landscape governance” paper presented at the Seventh Annual Colloquium of the IUCN Academy of Environmental Law 2009, 5 November, Wuhan, China. Martin, P., and Kennedy, A.L., “Creating network-based innovations for improving the supply and welfare of rural health professionals” paper presented at the 10th National Rural Health Conference 2009, 17-20 May, Cairns.